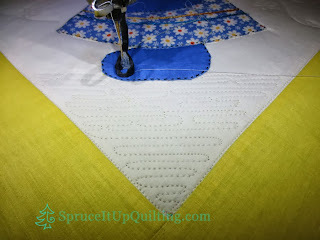 Spruce It Up Quilting: Lolah's friend Sue! You may recall I was entrusted to quilt this antique applique quilt by a wonderful (and brave!) friend back in July. 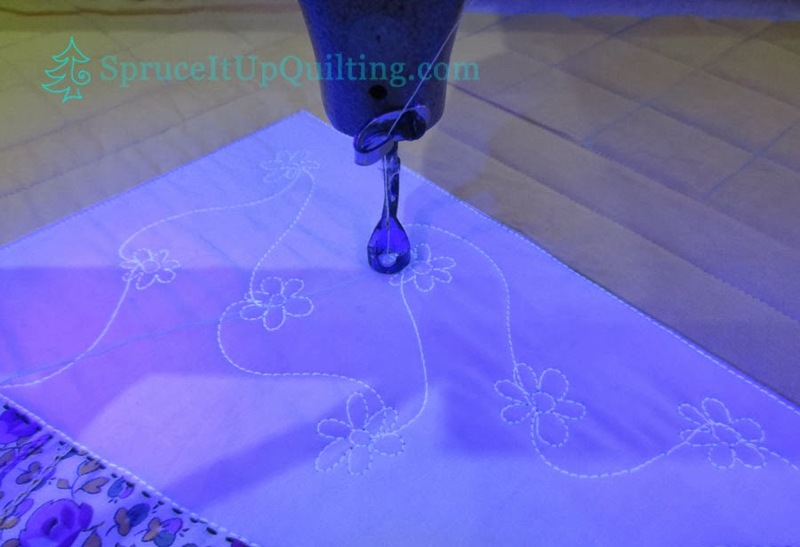 I'm sure you longarm quilters all remember your very first customer quilt and how nervous it made you feel! This is why I've had butterflies in my stomach all summer long! We'll be home for a visit soon and I needed to get this done so I could give it back to her quilted. 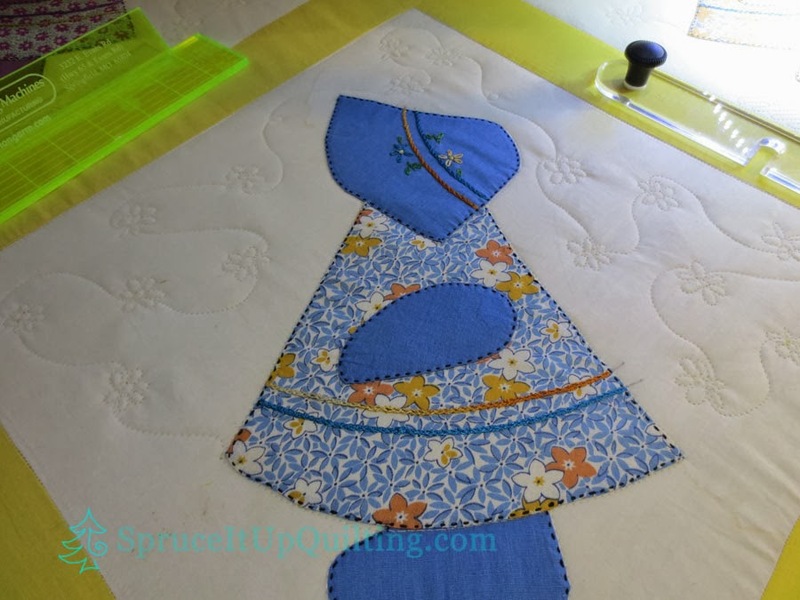 It's a beautiful Sunbonnet Sue her mother made in the 60s or 70s perhaps even earlier; it was never finished... some of the embroidery is missing not because of wear but because it wasn't done. It has some small stains, the blocks are not all square, the seams aren't perfect but it's still a treasure. 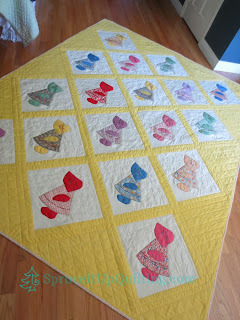 It was made by her mother and that makes it a special and beautiful quilt! I thought long and hard about what to quilt on this top. 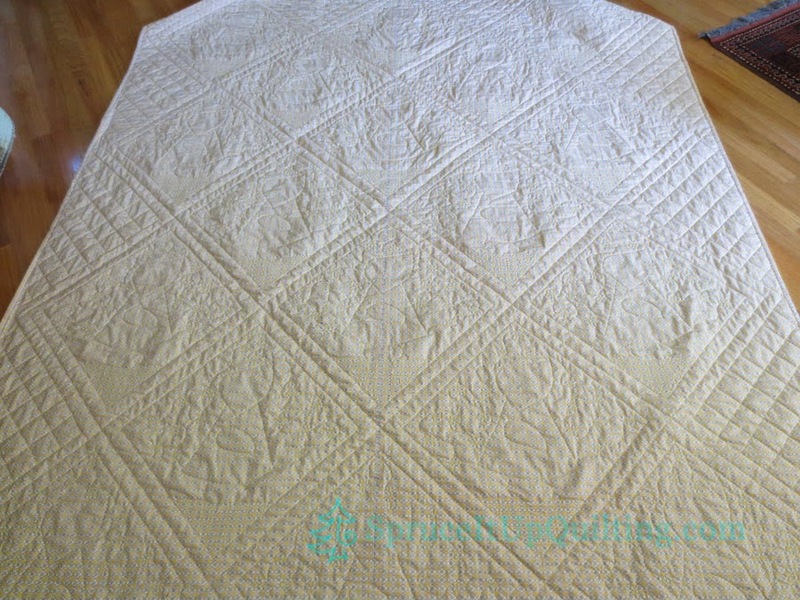 First I had to find a backing that would complement the quilt as I wanted to use it for the binding as well. 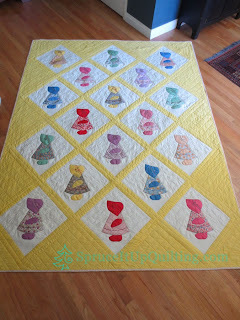 Lucky for me, Quilty Pleasures had this beautiful yellow print on sale in July and I bought the whole bolt! I love it when things fall into place like this! There were 3 fabrics on sale that day that spoke to me and I bought the rest of the bolts of each. If you recall, I returned home from a quilt show where I purchased 9 quilt tops to use for practice on Lolah! I have yet to start the first one because I've been busy with other quilts all summer as well as this "Sue" quilt. This is my first commissioned quilt! YIKES! And it's an applique quilt to boot! WHAT to do? WHAT to quilt? I loaded it on Lolah and proceeded to SID (stitch in the ditch) around all the applique and the blocks. Yes I know; the seams were not all pressed correctly but I ignored all that! This quilt needed to be strengthened and SID work is what would accomplish that. Then it rested for 1 1/2 weeks until I was comfortable to quilt it. How scary is it for a beginner to undertake such a task? I would look at it and scratch my head in wonder... and walk away to think some more! Then one day, the obvious set in my brain (it's slow most of the time but it gets it eventually! ): why not add some traditional which her mother would have done as well as some modern? A little background fill custom quilted along with some cross-hatching in the setting triangles might do the trick? I looked at the embroidery on the hats and some of the flowers on the dress fabrics and quilted similar flowers in the background. 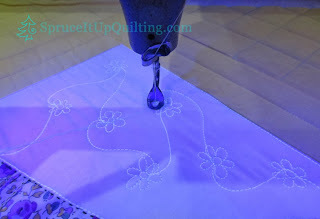 The blue light highlights these flowers; it is not glow-in-the-dark thread! 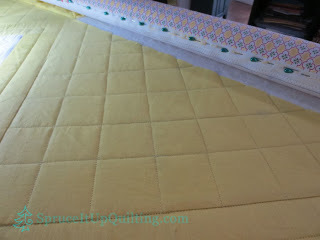 I used Soft and Crafty 100% Cotton quilt batting with yellow PermaCore in the bobbin and in the setting triangles and white PermaCore in the background. 30 hours later (I know... other longarmers wouldn't take this long!) 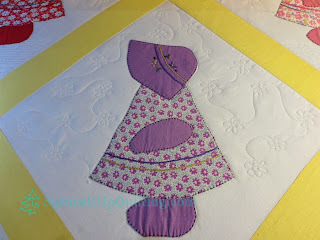 this is what Sunbonnet Sue looks like today! This quilt will always be dear to my heart because my very first quilt was a Sunbonnet Sue with a yellow setting, perhaps not as bright a yellow but still precious! Now it is also my first commissioned quilt! How fun! Margaret, this is coming home to you soon! I hope you like the modern take on the traditional! The butterflies aren't completely gone yet but I hope the trepidation will subside soon! 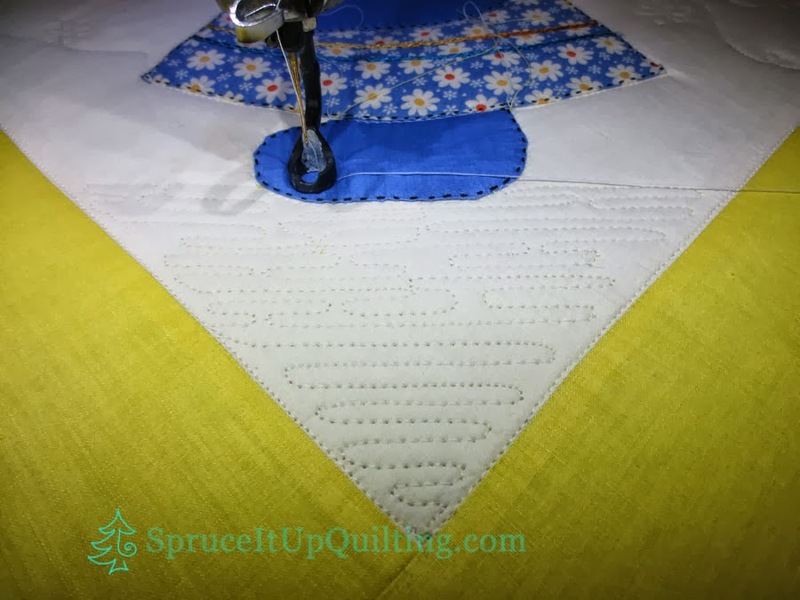 This was a terrific experience for me as I have several applique quilts of my own that need to be quilted and I know now that I will be able to quilt them with a bit more confidence. For that I have you to thank Margaret! You're a great friend! Wonderful Work Lorette, Your friend will love it! I hope so! thank you so much! Thank you for you confidence in me! Fantastic job on your first commission quilt! May you and Lolah have a wonderful run together. Thank you Marilyn! I hope Lolah will continue to be a good girl for a long time! It’s lovely, Lorette! Great job! Your friend will adore it and appreciate all the time and energy you put into making it just right for her! I am sure she will be thrilled to have her Mom’s quilt out of the cupboard thanks to your creative stitching! Thank you Jennifer. It really looks great mainly because her mom did such a great job appliqueing and embroidering. The quilting just frames the Sues!